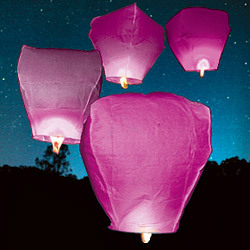 During our one mile fun walk we will be going into the park and setting off sky lanterns. Order a lantern in memory or in honor of someone you know that is fighting or has fought breast cancer. Lanterns are $5. If you are planning on getting a lantern please bring a lighter the night of the walk so you can light your sky lantern. Click the link below to watch a video click of what the sky lanterns look like being set off.